Bonikowsky, Laura Neilson. "Great Western Rail Disaster". The Canadian Encyclopedia, 25 January 2019, Historica Canada. https://www.thecanadianencyclopedia.ca/en/article/great-western-rail-disaster-feature. Accessed 23 April 2019. The railway train from Toronto (Canada West) was due at Hamilton at a quarter past six o'clock p.m., Thursday, March the 12th. It came on from Toronto as usual, and was proceeding at a moderate speed to cross the tressle or swinging bridge of the Des Jardins canal…. The moment the train reached the bridge the immense weight crushed through the timbers, and the whole structure gave way, and, with one frightful crash, the engine, tender, baggage car and two first-class passenger cars broke through the severed frame-work, and leaped headlong into the yawning abyss below. The crash of the Great Western Railway passenger train at the Desjardins Canal just outside Hamilton on March 12, 1857 was Canada's worst railway disaster to that date. It killed 59 and injured 18 of the approximately 100 passengers on board. The Great Western Railway, renamed in 1853 from the Great Western Rail Road Co, began in 1834 as the London and Gore Railroad Co. It opened its main line, from Niagara Falls through Hamilton, London and Windsor, in 1854. By 1882 it was operating 1280 km of track in southwestern Ontario and 288 km in Michigan. By then, competition among railways was fierce, and Great Western merged with its biggest rival, the Grand Trunk Railway. At the time of the 1857 disaster, railway building in North America was frenetic. The Province of Canada was immense, and transportation was difficult on the poor roads and on waterways that were frozen five months of the year. The development of steam locomotion and the low rolling friction of iron-flanged wheels on iron rails revolutionized transportation. The railways were an integral part of the building of Canada, aiding in the process of industrialization, opening new markets and bringing settlers to the West. Regular rail service linked communities, increasing trade and simplifying communication. The Great Western route near Hamilton crossed the Desjardins canal, which ran through a chasm nearly 20 metres deep, the distant sides connected by a timber suspension bridge. As the train, drawn by the engine called the "Oxford," began to cross the bridge, a railway workman at the Hamilton station slightly more than a kilometre away was watching for it. He "saw the steam suddenly stop, and a sort of dust arise. In a second there was no train to be seen." He raised the alarm and rescuers rushed to the scene. The crash was caused by a broken axle on the engine, which threw the train from the tracks and sent it crashing through the bridge deck and down to crash again on the 45-cm thick ice of the canal. The engine and tender crashed through the ice; the baggage car struck the tender and was thrown aside and slid along the ice without overturning. The first passenger car turned as it fell to land on its roof, breaking through the ice "and being crushed to atoms." The last car fell on its end on the ice, and stayed in that position. 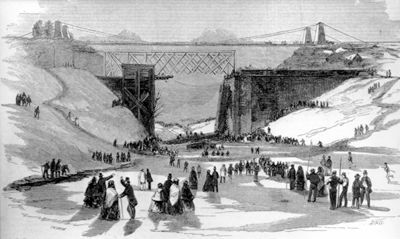 A passenger train crashed through the Great Western Railway bridge over the Desjardins Canal 12 March 1857, killing 59 people (courtesy Metropolitan Toronto Reference Library/T14996). The steep slopes on either side of the chasm were solid rock, snow-covered and slippery. Getting down to the injured was no small task. Ropes and ladders were lowered and rescuers had to chop through the bottom of the upturned car, in freezing water, to reach the victims. As survivors were brought to the depot, a crowd surrounded them, anxious to know who was dead. Among the casualties, 17 of the dead and five of the injured were from Hamilton. Among these, newspapers would report people of significance: "the eldest son of the city's first mayor, the captain of the first steam-boat to sail North American inland waters, the pastor of Park Street Baptist Church, the brother-in-law of the managing director of the railway, the curate of Christ's Church and a former alderman." From the press's viewpoint, the most notable person lost in the wreck was Samuel Zimmerman, the railway contractor and real-estate investor from Niagara Falls, widely believed to be the richest man in Canada. The Desjardins crash was shocking. We can only imagine the blow to the public psyche when a steam-powered train, a marvel of engineering, crashed and killed people. The reaction to it was much like our response today to an airplane crash. Investigations, an inquest and official reports followed, and the newspapers reported the lurid details. A large public funeral was held, attended by 10 000 people. The City of Hamilton declared March 16, 1857 an official day of mourning.